One of the things I remember most about Halloween as a kids was the Charlie Brown Halloween special about the Great Pumpkin that would show up on tv the Monday before Halloween. There was something about Linus’s faith in the Great Pumpkin that I always thought was quite something – especially in the face of all the doubters! 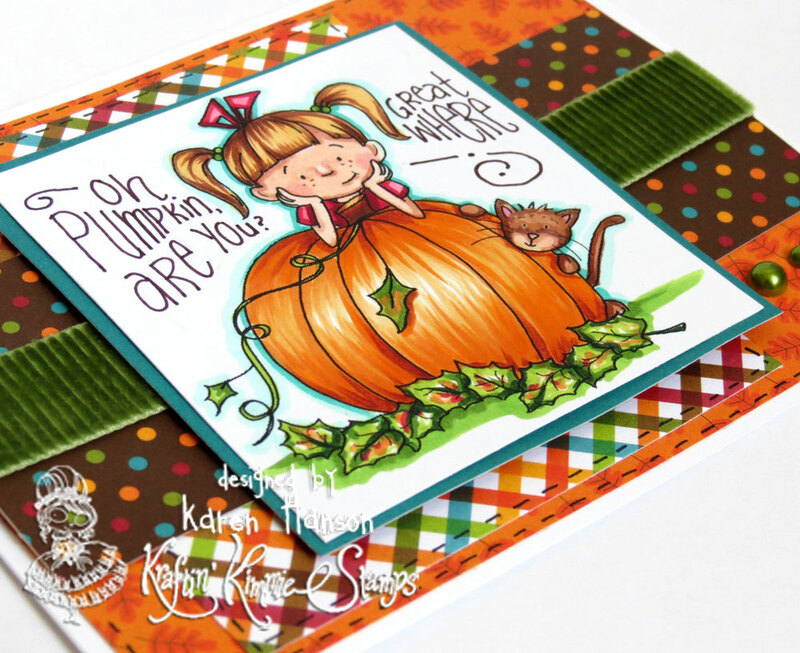 So, when I first saw this cute stamp from Kraftin’ Kimmie’s “Hey There Punkin'” set, I couldn’t help but think about that movie. And Lulu, perched behind that pumpkin looks just like she is pondering the great mysteries of the Great Pumpkin this Halloween! Lulu was coloured up with Copics, and I picked colours to match the cute Doodlebug paper. For a bit of texture, I also threw some corduroy ribbon on the card from May Arts – somehow corduroy scream fall to me! The sentiment was hand lettered – a quote from the Great Pumpkin of course! 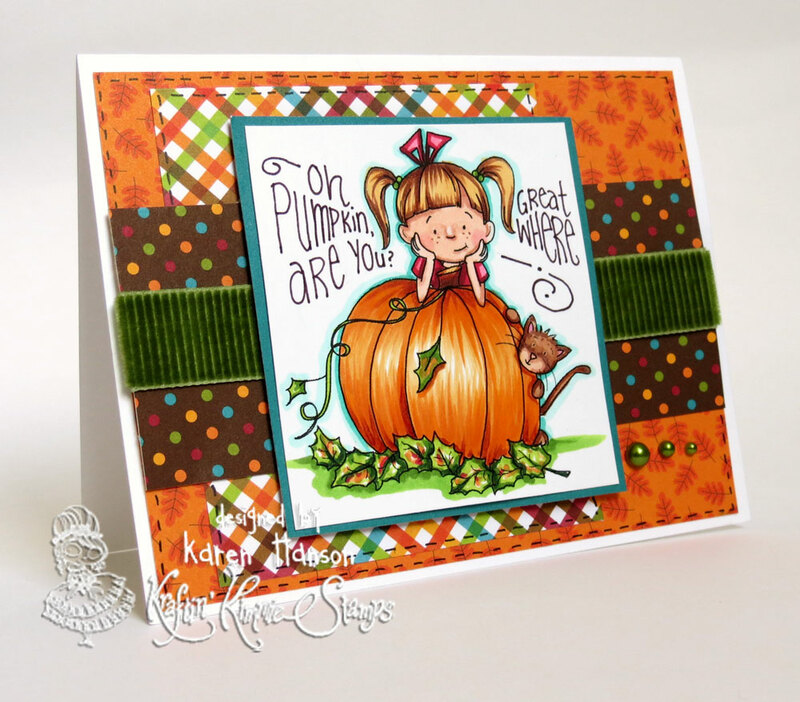 Well, since it is Wednesday, it is challenge time at Kraftin’ Kimmie Stamps. We want EVERYONE to be able to play along so your submission can use ANY stamp and can be any theme, any style, any design and it can be a card, a scrapbook page, an altered item….you name it!! It must be a NEW creation and you can enter over on the Kraftin’ Kimmie blog until November 4th at midnight! At the end of the month one random winner will be chosen from all the submissions for the whole month and will receive a $20 Gift Card to the shop! 2 and a half more days until Halloween! Thanks for stopping by! 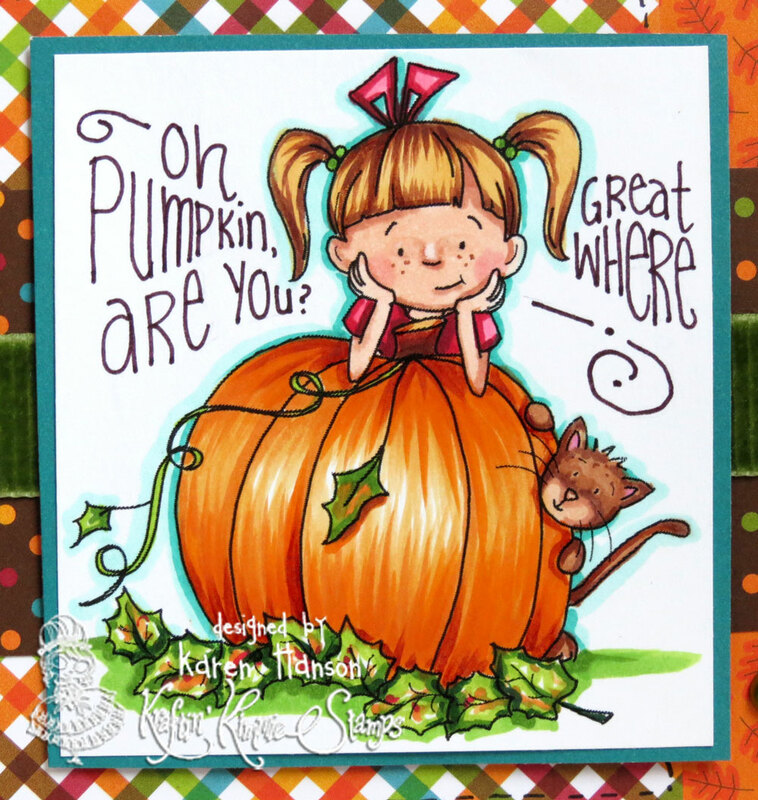 This entry was posted in Cards, Kraftin' Kimmie and tagged halloween, kraftin'kimmie by Scrappy Canuck. Bookmark the permalink. You rock the coloring on this! Super cute as always. Hope you’re doing well. Alice! So good to hear from you! Hope you are doing well too!